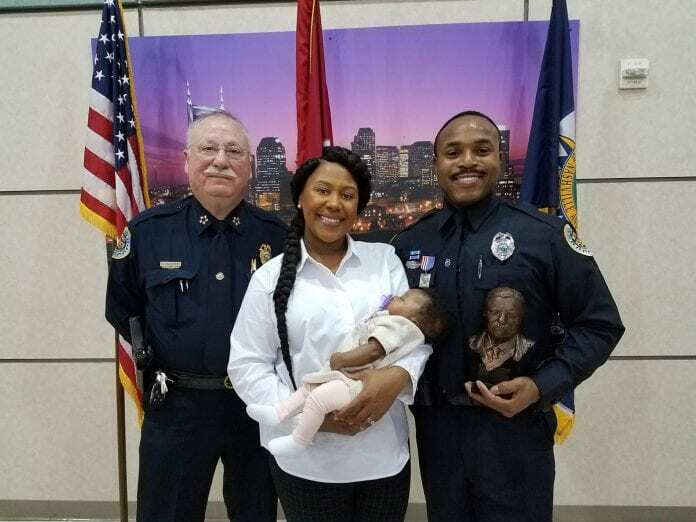 Officer Terrance McBride and Chief Anderson with Officer McBride’s wife, Candace, and their daughter. 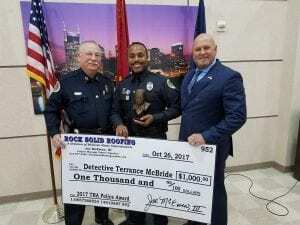 NASHVILLE, TN — Chief Steve Anderson and the local chapter of the Theodore Roosevelt Association recently presented Officer Terrance McBride, who was seriously wounded by a shotgun blast fired by a New York ex-convict, with the Theodore Roosevelt Police Award for Nashville & Middle Tennessee. McBride, a four-year MNPD veteran, was honored during a noon ceremony in the community room of the Hermitage Precinct. The Theodore Roosevelt Association Police Award is given to an officer who has rendered outstanding and praiseworthy service to the department and the community despite a serious handicap, illness or injury. Just before sunrise on December 13, 2016, Officers McBride and Ky Luu responded to the Cumberland Inn on W. Trinity Lane after a citizen reported that a man in room 104 was potentially wanted on outstanding warrants and had spoken of committing a robbery. When the officers knocked on the door, it was answered by a woman who had track marks on her arms and admitted to being a heroin user. Drug paraphernalia was plainly visible through the open door. When the officers twice asked whether anyone else was present, the woman responded no, although her mannerisms appeared strange. Officer McBride walked toward the bathroom, spotted parolee Paul Hardesty, and yelled for him to show his hands. A shotgun blast then rang out from inside the bathroom. Officer McBride was hit in the shoulder. Both officers returned fire. Officer Luu worked to provide cover so that they could both exit the motel room. Officer McBride was rushed to Vanderbilt University Medical Center. Over the ensuing months, he endured four surgeries to repair damage from the shotgun wound, all the while looking forward to his return to serving Nashville’s families as a member of the police department. He returned to light duty in March 2017, and to full duty in April 2017. In August, McBride transferred to the Domestic Violence Division where he is now a detective working to help women and children impacted by violence in the home. McEwen Home Improvements & Rock Solid Roofing, the sponsor of the Theodore Roosevelt Award for Nashville and Middle Tennessee. The Theodore Roosevelt Association established the police awards program in honor of Roosevelt’s distinguished service as President of the Board of Police Commissioners of New York City from 1895 to 1897, and in recognition of his lifelong admiration for the police. Other cities that present the award include New York City, Metropolitan Washington, D.C., San Diego, Dallas, and Suffolk & Nassau Counties in New York. Through the generosity of the continuing award sponsor, Rock Solid Roofing Company, a Division of McEwen Home Improvements (RockSolidRoofingTN.com), and the Theodore Roosevelt Association, Detective McBride will receive a $1,000 cash award, a medal, and a bust of Theodore Roosevelt. A bronze plaque, which bears a likeness of Roosevelt for display at the MNPD, will now include the inscription of McBride’s name. Previous articleLaDonna Boyd Appointed President/CEO and Chairman of R.H. Boyd Publishing, Corp.